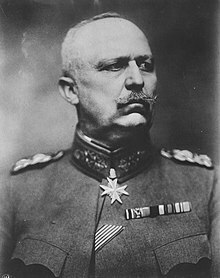 Erich Friedrich Wilhelm Ludendorff (April 9, 1865 – December 20, 1937) was a German general, the victor of the Battle of Liège and the Battle of Tannenberg. From August 1916, his appointment as Quartermaster general made him the leader (along with Paul von Hindenburg) of the German war efforts during World War I. The failure of Germany's great Spring Offensive in 1918 in quest of total victory was his great strategic failure and he was forced out in October 1918. What the enemy allows to us and praises in us, must be bad for us. We must all understand that only manly discipline—unconditional subordination to selfless leaders guided only by their public spirit, relegation of our own thoughts, and confidence in the Führer—can guarantee that the moral force of the individual shall be aggregated into a power that will effect the re-building of the nation and the Fatherland. The un-Germanness in and about us...lies primarily in a lack of racial sense ... in international, pacifistic and defeatistic thinking and, finally, in the considerable advancement of the Jewish people within our boundaries. For example, Italy and Soviet Russia, superficially considered, each seem to constitute a united people. But any scrutinising glance will perceive there tensions which will disintegrate the peoples of these two States immediately the outbreak of war permits them to explode. During the years of the so-called peace, politics—total politics—have only a meaning in as much as they prepare for total war. A field marshall is born, not made! I reject Christianity because it is Jewish, because it is international, and because, in cowardly fashion, it preaches Peace on Earth.